Jeff says his busy and disorganized schedule was his biggest obstacle to fitting fitness into his schedule (left). 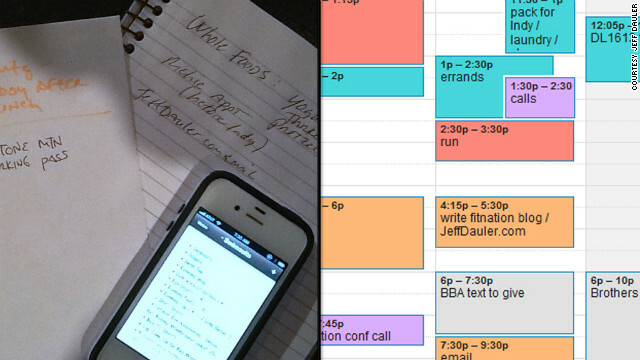 His first order of business in the Fit Nation Challenge was to spend time scheduling everything in his online calendar (right). Editor's Note: Jeff Dauler is one of 7 people selected to train for and compete in the Fit Nation Triathlon Challenge. Each participant gets all of the training and gear necessary to compete in the race, and they'll finish their journey in September at the Nautica Malibu Triathlon. A very busy guy, Jeff is the co-host and executive producer of The Bert Show, a nationally-syndicated radio program. He has realized that time management is going to be his biggest hurdle. Here was my Facebook status update: "Know what the hardest part of the triathlon training has been so far? Time management." Here's an email from Matt, one of the Fit Nation producers, that I received exactly 8 minutes later: "I just saw your post on Facebook about time management. Not to add to your list, but think you could write a blog for us about that by next Monday? 300-500 words?" And that's how it happens. Plans destroyed by something I wasn't planning on. A blog request from my Fit Nation producers. A lunch invite with a business associate. Drinks with a friend. Traffic. Weather. In my head, I have time for it all, and more. But I'm always short on time and abundant with to-do list items. And I only have one job and no kids. How do people working multiple jobs, or juggling work and school do it? How about parents? How about single parents? How about single parents with multiple jobs? They are working with the same 24 hours I am ... and they're getting it all in. And, thanks to my awesome Facebook family, and Dr. Gupta, I got some great ideas. 1. Schedule EVERYTHING. And by everything, I mean EVERYTHING. If you are anything like me, you've got a couple of lists here and there, plus one in your head. You know what you have to do, and when it's due. But because of your system (or non-system) of managing your to-dos, you aren't prioritizing and you aren't being realistic with your time. 2. Look at the big picture. Not just what you have to do today, but look at the week/month/next six months. If you see the next two weeks are filled with "appointments" then you can start planning accordingly. If you see this week is pretty light but the rest of the month is packed, you can use the free time to hit the mall, movies, or manicurist. 3. Say "no." Don't be afraid of that word. Using it doesn't make you unkind, ungrateful or rude. It actually makes you polite, because when you implement the "no" you are prioritizing the valuable things in your world and moving the fluff stuff to the side. Can you move those errands? Then enjoy your cheese dip. No? Enjoy your protein bar in the car as you handle your priorities. Besides, you don't even really know that co-worker or care about her sister. His answer: When he's in something, he's in it 110%. He commits himself to maximizing that time, whether it's personal or professional, and not multitasking. That's easy for him, because he knows his schedule allows for time to address everything ... and he also knows that once something is on his schedule, it's a priority. It deserves his complete and undivided attention. Even us non-globetrotting neurosurgeons can follow this rule; we SHOULD follow this rule. I'm getting a system in place, and so far, it's working great. I've only been in it a couple of weeks, but I see results. When I'm one-on-one with someone, I'm more focused on that experience. When I get an invite or offer, I'm able to quickly see if my involvement is realistic or will totally throw me off. I've eliminated emergency errands because I'm looking ahead and consolidating tasks. If I can stick with this ... and I think I can ... it'll only be a matter of time before I, too, am a book-writing brain surgeon who is on TV. Learn how Jeff has scheduled everything by visiting his blog. You can follow The Fit Nation Challenge on Facebook and Twitter, or right here on The Chart. My wife and I have been doing Triathlon for two season and starting our third now. My wife works three (yes three) jobs and we still find time to get in our training. Last year we even took it to a higher level and completed an Ironman. This season we have seven events on the schedule. There is time to get everything done and it is about commitment and making the training a priority. Feet on the floor at 5am for a morning workout is fairly normal. There are things we have to say no to on a regular basis but in the end the accomplishment makes it all worthwhile. Enjoy your journey to your first triathlon and I can promise you that you will be hooked from then on. Do you put in a 5-minute or 2-hour slot for s3x? Hey Jeff, I thought we had 25 hours a day. This is a leap year, and although I was born on that last day in Feb, I still can't figure out if we have 364 or 365 days in a regular year, and/or 365/366 in a leap year. Oh, I'll have to get back with you... gotta go eat lunch, walk the dog, check the mail, do a bank deposit, pack bags for Atlanta, shop for "casual wear", fill the car with gas, eat lunch – wait, I already said that... pick up the kids at school, call a couple clients... well, you get the picture! See you Thursday. It always seems to me like the triathalon takes 3 perfectly fun activities and turns it into some type of renunciant religion. If you are eating a protein bar in a car because you want to be a triathlete, you have made a wrong turn in life somewhere. You eat the protein bar in the car to make your sales quota and you go run later to celebrate. Ride your bike to the pool or the lake, swim a little, run a little, find something to climb. It is a lot of fun without a training plan or a $400 tri suit. I know some people are ambitious, but another way to look at all this, is why? What's the point? An overscheduled life is misery and people get addicted to it. Racing through life to get things done and not enjoying it is not a great way to live. What about stopping and talking to someone in a store or spending that extra time with family? Anyway, it's your life, good luck with the race. I'm a marathoner, and I do the same thing. I have a hard time remembering to do things, so my days are scheduled like this so I don't forget anything. I'm a student and I know exactly where I'm going to be everyday and I know what im going to be during. Time management is the only way to get though life. GREAT GREAT JOB & CONGRATULATIONS ON TRAINING YOURSELF INTO A BETTER YOU : ) You inspire me. Love your posts! Keep up the good work. It's fun watching you transform personally and physically before our eyes. I personally use Ordinem Deed for as my task manager. Very helpful tool in my professional life. What online calender do you use? As a new nurse, wife, and mother to a 2 yr old and 6 month old I'm looking to find a way to schedule time to breath right now and then maybe attempt something big in 2013. I recommend the use of an auto-scheduler to schedule everything. A few have been released since this article was written and are described at ScheduleU.org. They dramatically reduce the overhead required to schedule everything. You have some really great articles and I feel I would be a good asset. I'd absolutely love to write some content for your blog in exchange for a link back to mine. Please send me an e-mail if interested. Thanks!